…or Phill Jpts (pronounced the Scottish way) . Once again the nice folks at Gap Comedy brought a first tier comedian to our cosy, sold out village hall and the startled, but game Gappers were treated to an evening of funny and challenging material. The house was opened, the crowd surged in, drinks in hand, and were treated to the back of a large man wearing a red plaid shirt sitting onstage, and DJ’ing punk hits from a laptop. Act one was poetry from Porky the Poet, Mr Jupitus’ anarchist alter ego. I loved his concept that William Blake only wrote one poem about tigers because it’s hard to rhyme anything with the word, orange. Porky was once invited to open for Madness (a prominent ska band from Camden Town big in the 70’s & 80’s), which was madness and proved that opening for a band as a poet is a chancy business. During the interval as I wandered around eavesdropping I was interested to hear that people found Jupitus to be too aggressive. Very reasonable if you find someone who suddenly and aggressively (using naughty words!) attacks hecklers when previously they had been chatting away at more polite vocal levels. And our Gap heckles were pretty lightweight too. 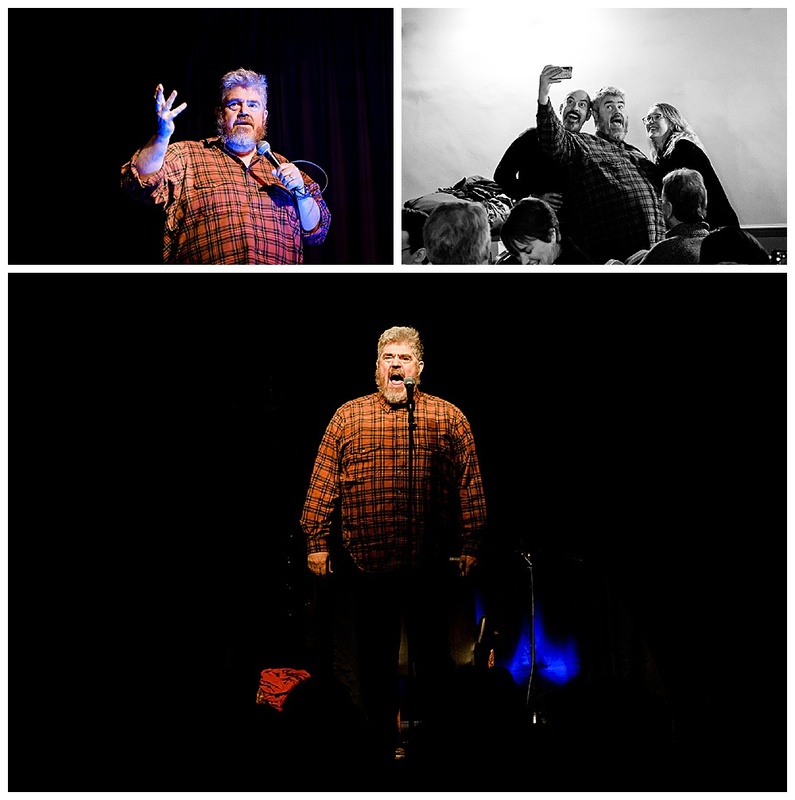 But Jupitus’ rules for heckling included; Be clear, Be relevant, and Be funny among other heckle concepts. And if said heckler got a bigger laugh than he did, then they would be brought up on stage to present a tight 5 minutes of comedy. None of us managed funny, so that was a wash, but failing in his guidelines did bring a pile of salty invective upon the hapless heckle hopeful. Act two was Phill Jupitus as Phill Jupitus, or Jpts as he now lives in Scotland and that’s how the Scottish pronounce his name. He does accents well. He did a very funny riff on the expectation that hotel biscuits in Scotland will always be two Walkers shortbread fingers, and the time is wasn’t. How that devolved into a Mexican accented story about puffins is still a miracle of modern comedy. His final bit was as the father of a lesbian daughter trying to figure out who pays for a lesbian wedding and calling Sandy Toksvig, or Lesbian Google, to find out. Another excellent evening of comedy. Next up Jo Caulfield on February 8th.